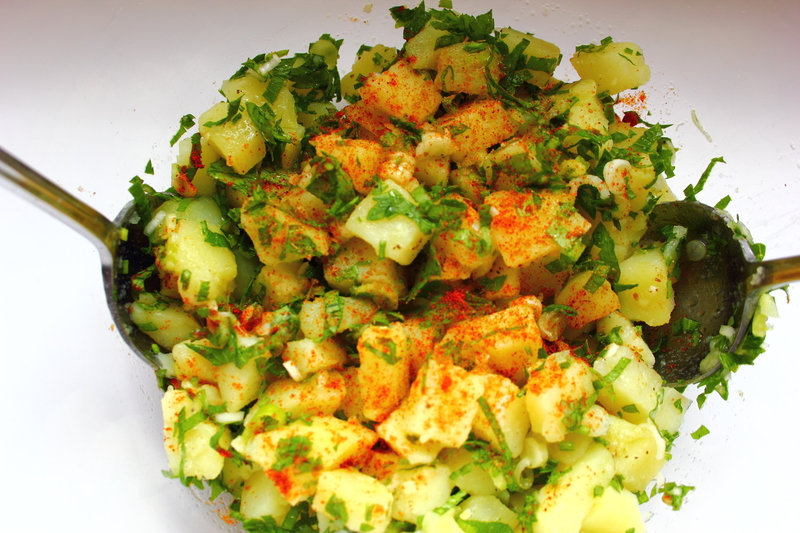 Salatet Batata (Summer potato salad) – Flogging Delicious! Now that summer’s finally here, I am making the most of having lighter lunches instead of fueling up on hot, stodgy foods that I need to keep me going during the colder months. I absolutely love potatoes in all their forms (as fries…ahem…), but especially in a salad, served cold and mixed with parsley and spring onions. It’s so light, citrusy and refreshing and is perfect for picnics, as a side to grilled meats or fish, on the go or as a light lunch during work hours. I recently got a text from my friend after she had come round, telling me she wished she had taken some of it with her to have the following day. It’s honestly that good! Set a pan of salted water on the hob and add in your potatoes. Leave to boil until cooked, approximately 20 minutes. In the meantime, wash and finely slice your spring onions. Finely chop your parsley leaves, discarding the stalks (you can freeze these and save them for another day of cooking). In a bowl, mix the potatoes, onions and parsley together, seasoning with salt and ground pepper, your lemon juice, olive oil and cumin. Add chilli to taste and enjoy! I love mine the next day straight out of the fridge, all lovely and cold! Yum!